The community of Lough-ill are to be commended for the magnificent work that has been undertaken within the small village to fight back against the decline of rural parishes that is evident all over the country. At one time, Loughill village had a shop, a post office and three public houses. Like many rural villages, it saw all these businesses close with the exception of one remaining pub that opens only at weekends. Almost four years ago a group of parents sat and spoke about the problems that they saw within their community. There was no children’s playground, the nearest one being in Foynes. There’s no football pitch in the village as the club is in Ballyhahill where all the local players go to train and play their matches. It seemed that every facility that parents needed wasn’t in the area which meant they had to travel from their own community. But this group of enterprising people decided to look at the possibility of creating a playground within the village. They looked at few sites and finally got the break they needed when a wonderful local lady, Mary McNamara, gave them two and a half acres of a derelict site in the village. Suddenly the possibilities seemed endless. The original playground idea now became a local park, thanks to the generosity of the landowner. They soon had a plan to submit to the local authority that involved a car park, a playground, incorporating a floodlit 40 by 20 Astro turf pitch, a river walk, park benches, a fairy trail, a story-telling chair, a gazebo, a sensory garden and much more. 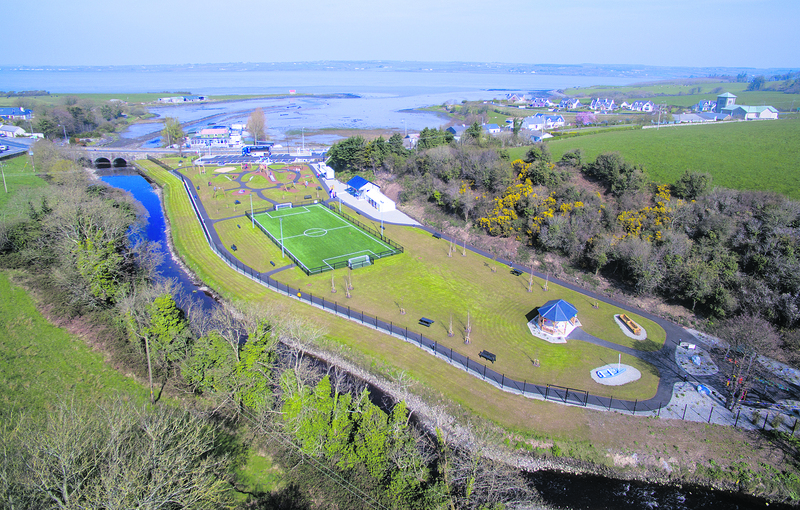 It was a courageous “Go big or go home” plan that paid huge dividends and saw the dream become reality on Sunday last when the park was officially opened. “We were very fortunate in the help that came on bord to back us,” Declan Hallett, the committee chairman, told me. “The park is open to people of all ages from zero to 90,” he added “We’ve a walking track that can also be used as a running track, and it’s a safe and secure place for children. They can run free because the park is enclosed, even though it’s all open-plan inside.” The outer ring is a third of a kilometre long and is surfaced with tarmacadam. Situated on the Wild Atlantic Way, the hope is that it will become a stop-off point for visitors. It has picnic areas and benches for visitor use. During the opening ceremony, Declan thanked everyone involved in the effort. He paid tribute to the hard work of a focused committee and a dedicated community. He also thanked politicians and schemes that came to their aid, particularly Councillor Stephen Keary and his colleagues in Limerick County Council, Minister Patrick O’Donovan, West Limerick Resources, JP McManus, former minister Michael Noonan, and many more, but paid particular tribute to the lady that made it all possible, Mary McNamara. He also thanked the people from Loughill and its sur-roundings who volunteered their time, machinery and skills to the project. Guest speakers included Minister O’Donovan, Stephen Keary, and the local parish priest Father Austin said beautiful prayers of hope and thanksgiving before finally blessing the park. The local Wrenboy group formed a guard of honour at the gate and the ribbon was cut to the rhythmic beat of a dozen bodhráns before children flocked through the gates heading for the playground, others to the pitch carrying footballs. The festival atmosphere continued with music playing over loud-speakers, ice-cream and catering vans parked at the side, and a hospitality tent that served the most delicious pastries including giant doughnuts that everyone enjoyed. It was lovely to see people of all ages wal-king by the river, admiring the view, stopping to talk to neighbours and strangers alike and generally engaging in a fun-filled day in glorious sunshine. Declan Hallett was very happy with the day. The beautiful day and a great turn out from the community was clearly immensely satisfying. “We’re delighted with the turn out, we didn’t think there would be a queue for swings and slides,” he laughed. The committee and the parish of Loughill can be proud of what they have achieved in a short time. 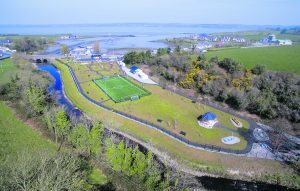 They have turned their village in to a place of welcome, of beauty and service for all who will continue to enjoy this beautiful Abha Bhán Park for generations to come. It strengthens my belief that nothing is more powerful that a group of hard working, dedicated people who volunteer their time and effort to make life better for everyone in their community. It’s also a fitting tribute to the generosity of Mary Mc Namara who shared their vision for the future of their village.